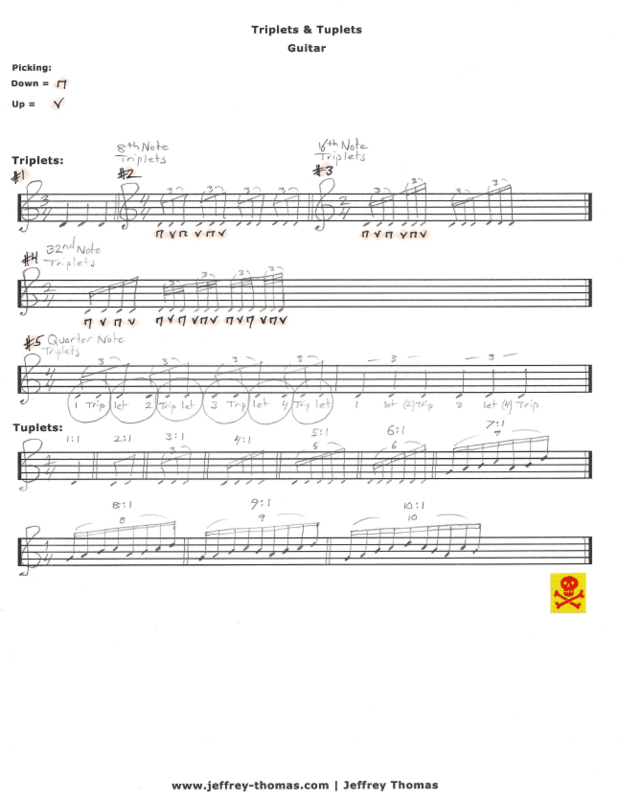 Learn to play Triplets and Tuplets on guitar with my free triplet study guitar worksheet. I also have a video lesson for this tab you can view here: (Tripets & Tuplets Guitar) This is a great lesson that explains the many different forms of triplets and the ratios and thinking for playing tuplets. The video lesson and guitar tab shows 5 different forms of triplets and 10 forms of tuplets thinking in ratios. There are lots of useful picking tips and help in the video version. Want the guitar tab for free? Just send in your email address using the form provided. Looking for the best online guitar lessons? Fill out the Schedule A Free Lesson form to set up your free Skype guitar lesson today. This worksheet is great for any guitarist to start learning the complex details to play triplets and tuplets. Make sure to check out more free online guitar lessons on my tab, video and blog pages.